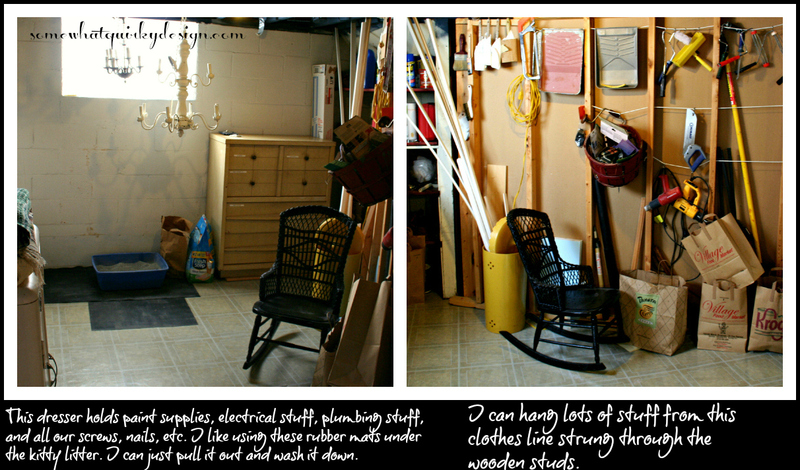 My basement is a workhorse - a true utility room. 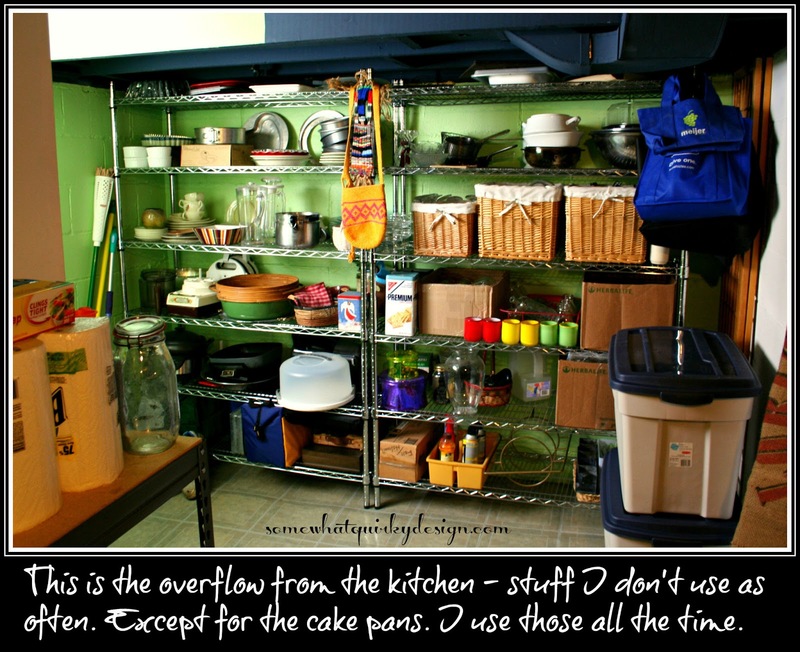 Our house has small closets (that are pretty clean) and a tiny kitchen (that tries to stay clean) and I need a place to put our stuff that doesn't fit there. 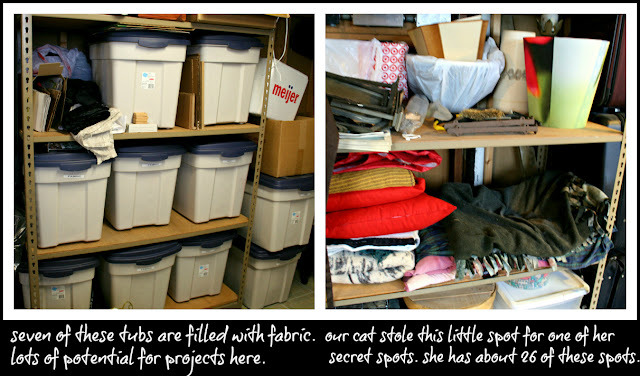 I also need a place to put my stock and supplies for creating. It doesn't bother me that the basement isn't pristine. Even when I spend two weeks cleaning and organizing it, it doesn't look clean. But that's okay. I can deal. I know that many of you won't appreciate my "clean" basement. 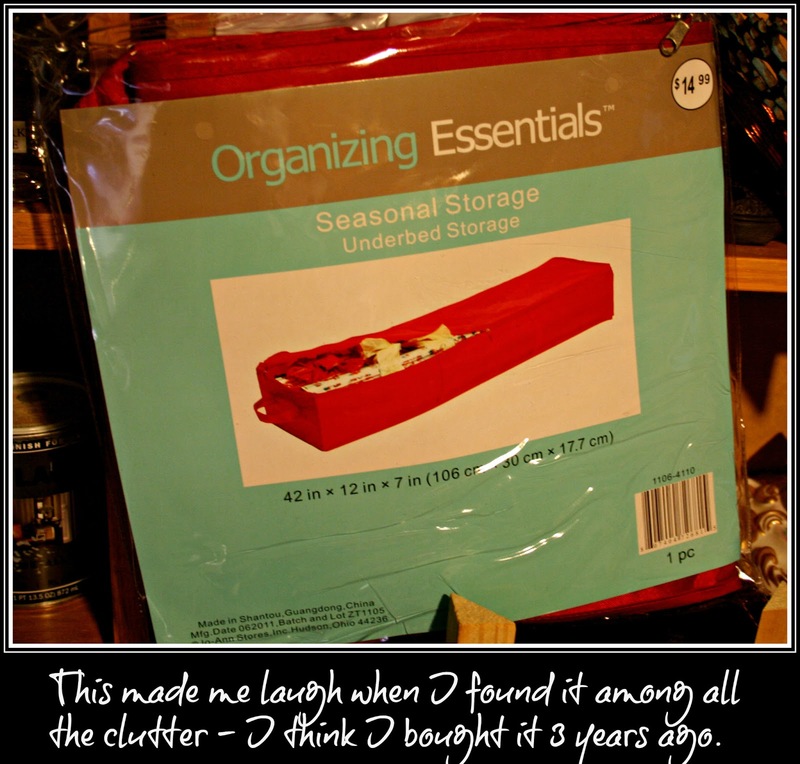 You will think it looks cluttered. And messy. It would bother you. But I can live with it. I do find that I am not quite so content with my laundry room. It's not pretty. I really wish it was. In my dreams I have a laundry room designed by Sarah Richardson - like this, or this. If I had one of those I would never leave anything out on the counter. I would never leave my clean clothes in the basket for three weeks days. I would mop it twice a week and regularly wipe up every speck of dust and lint. I would fold every clean item precisely as soon as the timer went off. I would joyfully iron each air dried shirt to perfection all while listening to Mozart through speakers installed in the ceiling. I'm not greedy. If I was greedy I would want this laundry room. (can you hear the heavenly choirs singing?) 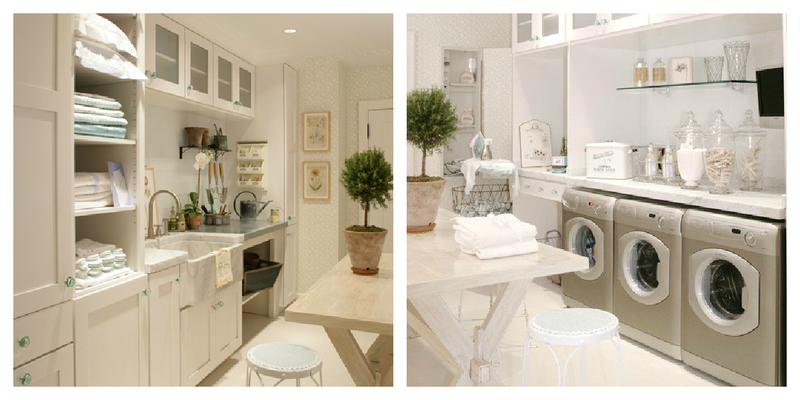 If this were my laundry room I would be tempted to feel "holier than thou" as my mother calls it. So I practice my humility daily in this laundry room instead. It is ugly. It gets messed up easily. The laundry chute drops clothes right in the middle of the floor. So while I don't have a bunch of dirty laundry hanging out in my bedrooms or bathrooms, the laundry room floor has lots of laundry in it. I try to put a basket under where the shoot drops the laundry, but it often gets kicked out of the way. Someday - probably next January - I'm going to make my basement look better. I have some ideas. Several actually. But I'm going to keep them under the belt. My little secret. I'm accepting ideas. I want to know what you think. All suggestions must have an aspect of frugality. Because I'm cheap poor frugal. 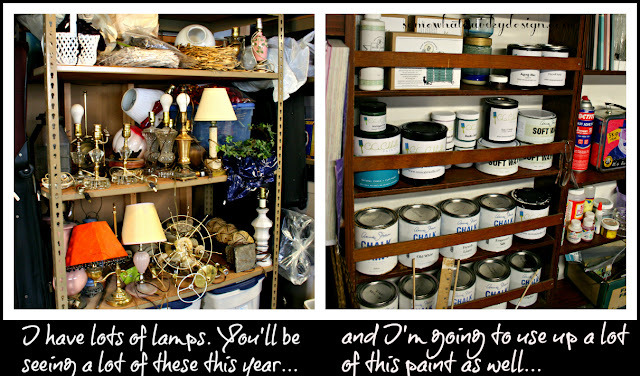 I know whatever I do, it will involve lots of paint. Should it be white? Should I put polka dots on my washer and dryer? Or maybe they would look good like this? And a sink like this? Or this? What would you do??? Tell me!!! I've got a basement that dates back to the stone ages, so I feel your pain! 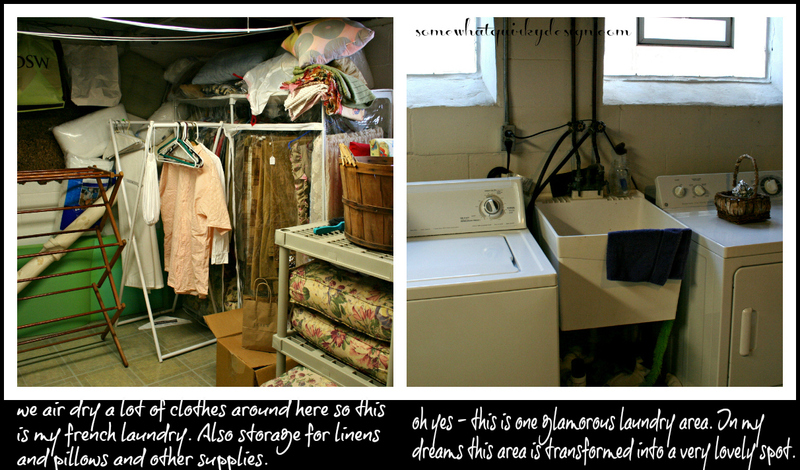 When I see "above ground" laundry room makeovers, I'm NOT impressed. 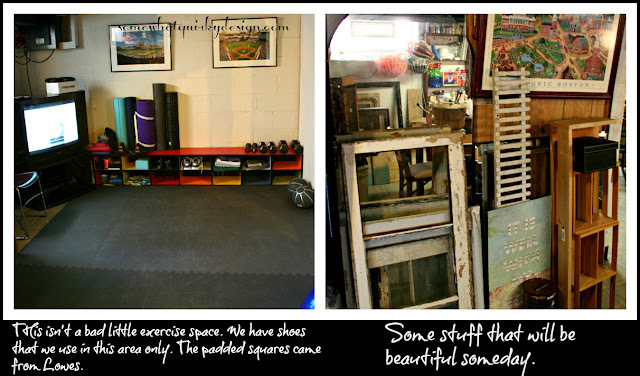 :) Let them come to my dungeon and transform it into a trendy bright space. 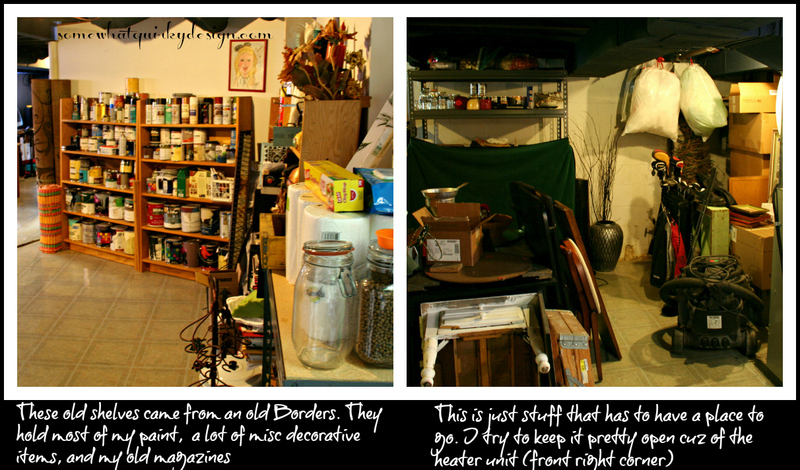 This is the basement of a creative person! Of course there is a little clutter here and there! I love it! Would you consider sharing this on the Farmhouse Style Blog Hop? www.greeneggsandgoats.com Oh, and I'm visiting from The Clever Chicks Blog Hop! You are rich and living high on the hog if you have #1 a basement, and #2 a laundry shoot. You don't find either in South Florida. Heck, I don't even have a laundry room. I have a hall with a washer, and the dryer (if it hadn't broken) would be in the adjoining bathroom. But I haven't replaced it so, I have been hanging my clothes to dry. So you have a good problem in my eyes and great potential for a fun fix up. How about starting with a basket or something to catch the dirty laundry? The rest I will leave to your creative, quirky genius. Okay, a heavy box to catch the laundry since the basket gets kicked. Build something in. I know you can do it! It looks like a great place to work to me! 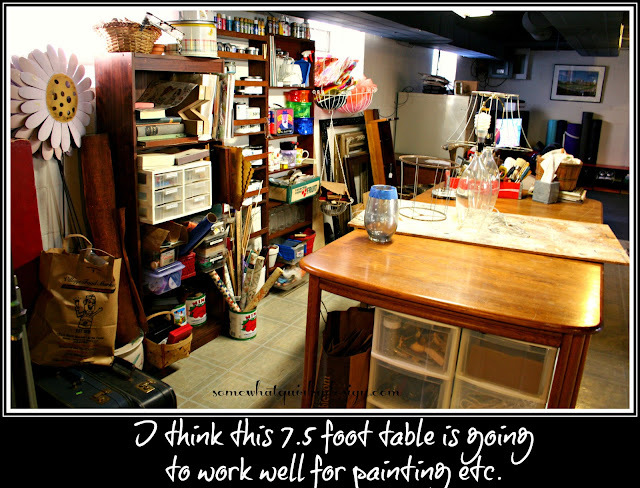 You KNOW those magazine studios and workshops don't REALLY look like that when someone is working there! It looks roomy and functional in that basement...I SO wish I had one!! We creative geniuses are messy...who cares? My sewing room looks like a tornado hit it. I think it always will! LOL You have it organized pretty well, IMO. I think the craft space you carved out is perfect, so make sure you actually use it. What the heck with all the lamps? Yes to the yellow washer and dryer, and yes to either of the sinks too. I say make it quirky, whatever you do. Great ideas. Thank you for sharing with the Clever Chicks Blog Hop this week; I hope you’ll join us again! I have small closets and no basement. Our washer/dryer are in the garage which is an improvement over being in the entryway when we bought our house (long story). We do have a full stand up attic. Both the attic and the garage are high on my list of to dos. I want my laundry area to at least be cute. One half of my basement is finished and rather nice the other half is quite a mess! Your stuff looks nice and organized and I love the green wall. Do you live in Michigan? I ask because that is where I live. I spotted some Annie Sloan paint on your shelves! If I wasn't back in school full-time I'd be painting! Just started using the ASCP and I love it! Holly Michigan is the closest stockist to me. I love quirkiness! Love all the comments I've seen here. Yes, creative geniuses usually have messes around them as one of your commenters pointed out. Thanks for visiting my blog! In answer to your question, I'm attending Central Michigan University online for a Bachelor degree in Community Development. It's funny that you've done a posting on your basement because I did a post awhile ago about my basement and was thinking about tweaking it since I bought a couple new things for it. I've never liked hanging in the basement unless it's already dark outside because I love light filled rooms but I love having the extra square footage! You should start a basement link party! Looks good to me. If you paint, I would go with a shade of white to brighten it all up. Or how about bead board? 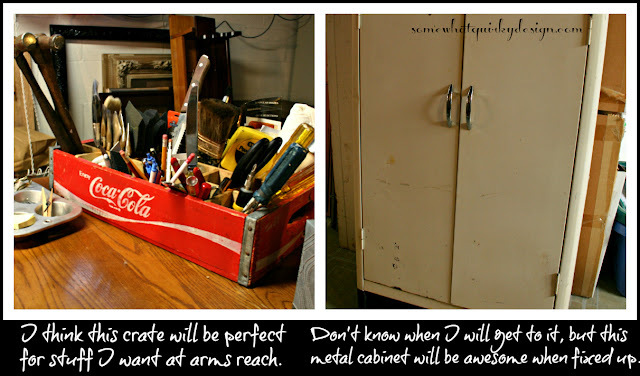 Or old cabinetry painted white with doors to make it uniform? I have the same problem, a hodge podge of storage and utility spaces and nothing uniform and I think that's why my work space is never "organized" looking. I can tell you really worked hard on this space and that's what is really important. I like your basement and all the storage. I have a small kitchen and really need a bigger storage room then i have, well i should say then my hubby has ( took it over with his man stuff). I gotta tell ya, I love the bright yellow with flowers washer & dryer. I think that would brighten up any basement laundry room..I'm kinda considering giving it a try..
As always, such a fun post and always enjoy your humor.